Although I'm sure 75% of you know all about this, I was thrilled to be clued into one of Mark's best tool add-ons --- the quick change adapter on the cordless drill. This adapter hooks onto the front of the drill and allows special drill bits and drivers to be popped in and out with a flick of your wrist. (To be more literal, on our drill, you just push part of the adapter backwards and the drill bit pops out. I've read that different brands require slightly different motions, but they're all easy to do with your hands full.) Some other names for the same thing include hex-shank or ultralok drill bits. With a quick change adapter in place, it's simple to swap back and forth between drilling pilot holes and then driving in the screw. 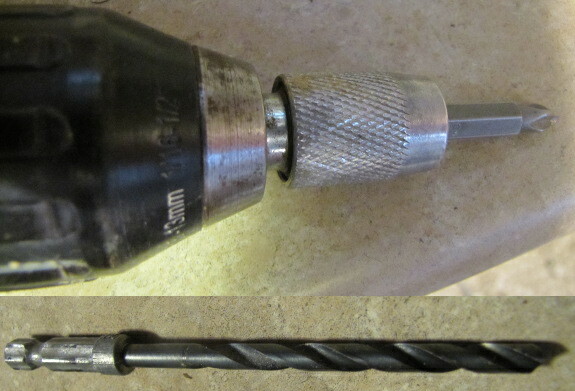 The only problem is that you have to use special bits with a hexagonal (rather than round) base, so if you lose your favorite snap-in drill bit, you might spend as long looking for it as you would have swapping between the drill bit and the phillips head driver. 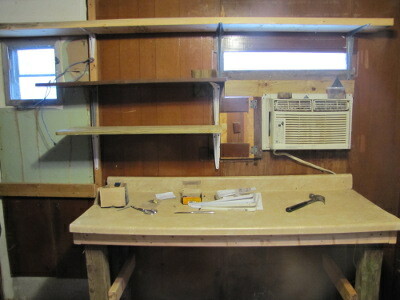 Maybe once all of our tools are organized, we won't have this problem any more? Our homemade chicken waterer is easy to put together by anyone who can handle a cordless drill. I wouldn't be showing off those skills too much or you will have too many requests on your hands when you visit! That's nice of you to say! If you lose a quick change bit sears has individual ones that they sell. If you like you can get quick change adapters to take regular round ended bits and make them quick change. They have nominal fraction size in 32nds that can take .005 smaller and .010 larger bits.